I recently returned from the Bouchercon World Mystery Convention in New Orleans, everyone’s favorite party city. I’ve heard my fellow authors rave about Bouchercon for years, but had never attended one. I was on a panel at last year’s Killer Nashville Conference, and my fellow panelists were excited about the fact the 2016 Bouchercon would be in New Orleans. The excitement was contagious, and I immediately registered. Now I know why so many mystery and crime writers have raved about it. There were well over 1,000 people in attendance—one person said it was closer to 2,000—and it attracts both readers and writers. Obviously the location had a lot to do with the huge turnout, but I was impressed by the big name authors in attendance, and the many excellent panel discussions. 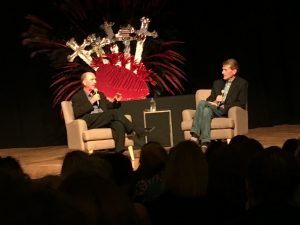 Among the hundreds of authors in attendance were Harlan Coben, C. J. Box, R.L. Stine, Meg Gardiner, Michael Connelly, Heather Graham, Lawrence Block, and Lee Child. We had the opportunity to march in a second-line parade from the host hotel to the Orpheum Theater where Lee Child interviewed David Morrell, and the Anthony Awards were presented. Here they are on stage. Bouchercon moves from city to city each year. Next year’s will be in Toronto, and the 2018 is set for St. Petersburg, FL, followed by Dallas and Sacramento. I’m planning a return visit in 2018.